Rifleshooter.com reviews the FN SPR A3G 308, bolt action rifle. 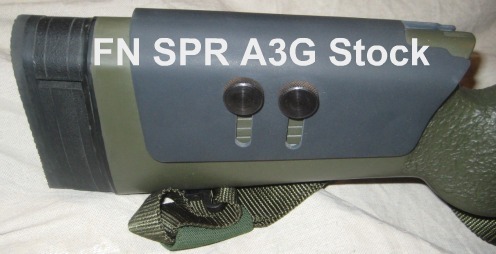 The FN SPR A3G is the flagship of the FN SPR line. FN SPR rifles use a controlled round feed action with a cold hammer forged chrome lined barrel. The A3G features a 24″ fluted barrel with well executed target crown, standard floorplate magazine, parkerized finish, bedded McMillian A3 stock and a titanium 20 MOA weaver rail. I prefer a standard hinged metal floorplate over a detachable box magazine. This is the only model that is offered in 308 with a standard floorplate. The standard FN SPR rifles have a matte blue finish and do not have bedded stocks. Initial impression: this rifle is a pig. No silly marketing here. It comes in a plain brown box, at the end there is a small white label with a serial number and “SPR A3G”, that’s it, no nonsense. The 11.5 lb rifle handles well. 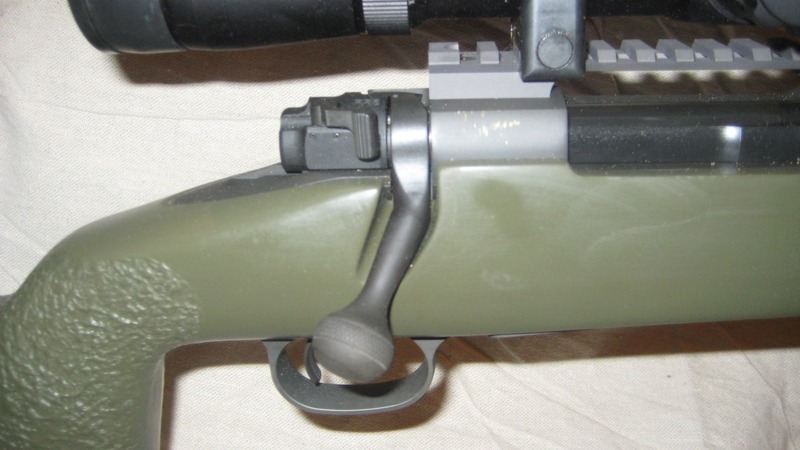 The green McMillian A3 stock provides adjustable length of pull via spacers. A cheek piece with field adjustable knobs. 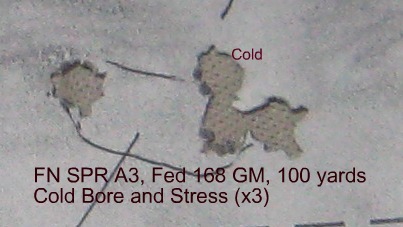 The stock is bedded by GAP for FN. All steel parts of the gun are parkerized, the bolt, safety barrel, action, trigger, floor plate- everything, and everything is steel. No cheesy plastic, no aluminum parts, everything is robust. 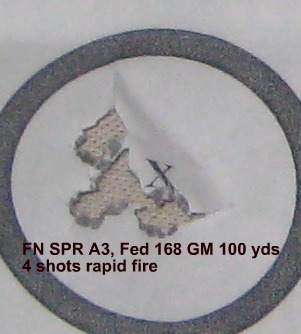 FN includes a log book outlining maintenance performed on the gun and the proof and initial accuracy firing. It included a .498″ test target. The gun is guaranteed to hold 1/2 MOA or better for 10,000 rounds. Optics: I mounted a Leupold Mark 4, 4.5-14x 50mm illuminated mil dot reticule scope with M1 1/4 moa turrets in badger medium rings. It is worth noting that Leupold has improved the controls of their illuminated optics. In the past, the intensity control moved continuously, without audible or tactile “clicks”. One mushy stop was the “off” position. On the new Mark 4s, the each end of the adjustment spectrum turns the reticule off, additionally they have added clicks, and an off position between intensity settings. This is a much needed improvement. I spent two sessions at the range sending some meaningful rounds downrange. 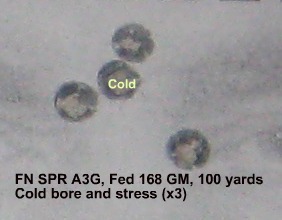 Ammunition was Federal 168 Gold Medal. In addition to the initial zero, I have shot two precision rifle 10 round qualification courses and a 200 yard verification group. The qualification course involves 1 cold bore shot, a two shot string, a three shot stress fire after intense physical activity, and a four shot group. I will not be sharing course of fire specifics on this website, so please, do not ask. All shots were prone off a Harris Bipod. 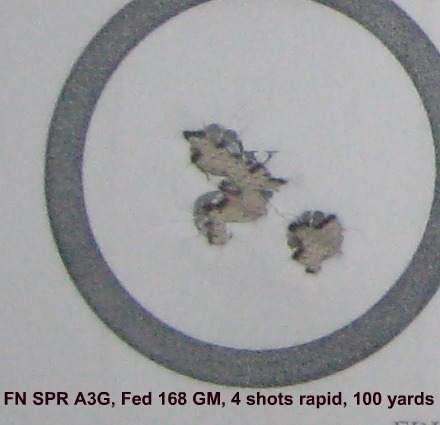 Below you can find typical results of those trips to the range. 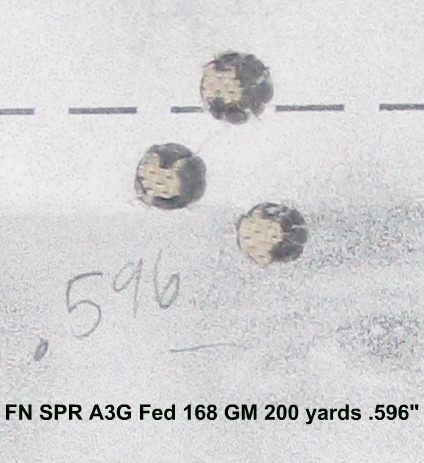 Here is the 200 yard group with 2.25 MOA on the gun. The target doesn’t have a clearly defined aiming point, so I am more then please with results. It is worth noting that I took my time on these three, the primary focus here was determining POI at 200 yards and system accuracy. The groups above were shot as part of a fairly demanding par time course. The action is noticeably beefier then a Remington 700, you also gain a much improved extractor. I lost two Remington extractors over the years so I know it can happen. With this system you gain an easy to field strip extractor and three position safety for a slightly increased lock time. The trigger is crisp and clean. The extractor has a cut on the bottom to allow the shooter to drop a round into the action and feed it without inserting it fully into the magazine. Overall, the gun carries well, shoots well and is a solid value for the money. I appreciated your comments regarding the FN SPR A3. How do you feel about persons shooting this rifle (or any FN SPR A-model) from the left side (in terms of comfort)? Thanks. I would guess it would be a bit difficult. Most southpaws are better served with left handed actions.